In September, 2011, I arrived in Manchester, with a view to hiring a car and working my way down to London, but after two days of more-or-less steady rain, I felt like I was still home in a particularly wintry Melbourne. On the third morning, as I was leaving to catch the train to York, I was greeted by another downpour. My runners had dried out from the day before but it was obvious that wasn’t going to last long. A man pushed past me, squeezing me against my case in the hotel doorway, raised him umbrella, almost poking out one of my eyes and took off into the deluge. I launched myself out as well, crossed the road through manic Monday morning traffic to the cafe opposite the hotel and ordered my first English breakfast, scrambled eggs and bacon on wholegrain toast. Delicious. Over coffee I prayed that the rain would ease just long enough for me to make it to the station. The prayer worked. As I left the cafe it stopped and I reached the station damp, as opposed to dripping. While in Haworth, I decided to catch the bus to Skipton to visit the castle, seeing I’d missed it on my way through. In 1090, Robert de Romille, a Norman baron, built a fort here, but its timber ramparts were not much help against the frequent raids of rampaging Scots. He replaced it with a more formidable stone castle, setting it on top of a rocky bluff. The Edge of the World. That’s what the sign said and, standing on the hill looking out to sea, that’s how it felt. 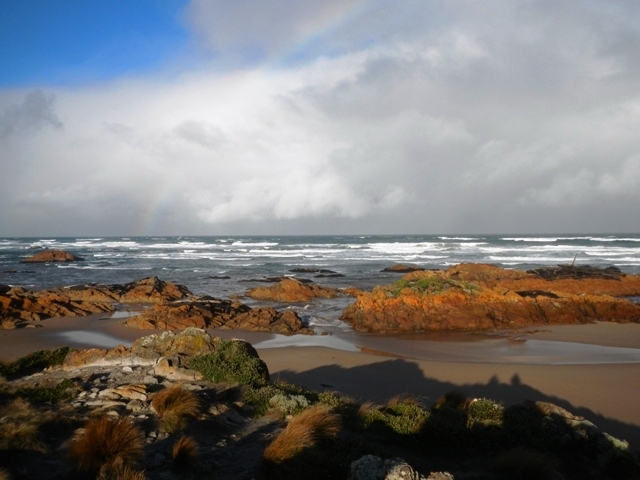 Untamed and untameable: Arthur River, North-West Tasmania. If you sailed from where the river enters the sea and kept going, you would hit South America without touching land. This accounted for the vicious wind ripping through me and I was grateful for the knitted beanie a caring friend gave me on my announcement that I was exploring Tassie in the depths of winter. My accommodation sat at the bottom of a steep hill, leading up to the historic village of Haworth, where Charlotte, Emily and Anne Bronte, grew up in their father’s parsonage. It was here they wrote their poetry, short stories and novels. At the top of the hill, I crossed the main road, passed under an arched stone-covered alleyway and entered a tiny town square and another era. The trouble with a brand new rental car is that there are no scratches already on it and so any I added couldn’t be blamed on the last person. I would have been happier with a ‘bomb’, as long as it kept going. Still, driving that Toyota Hybrid was like nothing I’d ever experienced before. It floated. There was not a bump or rattle, none of the normal sensations, certainly those associated with the cars I’m used to. I glided through the suburbs of Harrogate and out the other side.